Lhasa, Tibet (China) -- Three hundred miles of off-road four-wheeling. Past mud-brick dwellings and golden temples. Through scorching sands and freezing snow. From bottomless gorges to soaring mountains. My family and I have traveled every year since I was born, often to what many hold to be the literal “Ends of the Earth.” But the journey to Everest was completely unlike anything we’ve ever experienced. 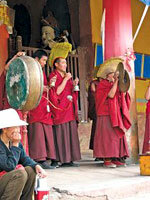 << Monks chant at the Palkhor monastery in Tibet. Despite being out of the country for an entire month, it took a mere six days to feel every possible emotion in the spectrum, to suffer from almost every kind of ailment, but most amazingly, to witness every possible extremity this planet has to offer. It would take me far more than 15 minutes at this Lhasa Internet cafe to fully convey the absolute experience of the entire expedition. Pictures can only express 999 words of the thousands worth saying to describe a place as vast as Tibet – the Roof of the World. The first day was already an adventure in itself, as we sped off in a Land Cruiser from the Tibetan capital at Lhasa (elevation 12,000’) through the dramatic Yarlung Valley of southern Tibet, passing spectacular scenery of agrarian life. From colossal carvings of the Buddha on cliff walls to snaking rivers carving their own way through the valley floor, we began the ascent up a steep mountain pass to view Yamdroktso Lake (14,500’), a dazzling sea of azure blue amidst the stony, beige surroundings. From the beginning of the trip, the entire plan seemed simple and relaxing, having a personal Tibetan guide and driver deliver us to some of the most remote and elusive locations of exquisite natural beauty the Earth has ever produced. However, as the trip progressed, we began to realize that, as life in Tibet has been under Chinese occupation, it would not be that easy. With Tibet being the center of such great controversy since China’s cultural revolution of the mid-20th century, which ultimately resulted in its subsequent invasion, the Chinese authorities have not failed in making traveling within the region quite, well, complicated. In addition to obtaining government authorization to enter the province, a police-issued permit is required for every site of interest outside of Lhasa. It had already taken weeks prior to the trip, a lot of money and plenty of stress to guarantee us permits, a process made even more challenging following the recent American protests for Tibetan independence a month earlier. Unfortunately, we did not realize just how difficult it would get until we arrived in the Tibetan town of Shigatse (12,800’), where we found ourselves overwhelmed by some sort of shady, underground transactions – all for the purpose of obtaining a single permit that we apparently lacked. Our driver and guide had quite a time chatting away in Tibetan, making photocopies of our passports, and dropping us off at what appeared to be a children’s festival, the center of all the hype that ultimately led to even greater uncertainty. Clueless as we were, the whole “deal” resulted in us having to leave our passports with an unknown man they referred to as the “leader” in a tent at the festival, along with a “cash payoff” of a couple hundred yuan. To risk or not to risk was the ultimate question, and while driving toward our next destination, we could not help but face great anxiety in realizing that we had just left our only form of identification with a faceless character in a sea of tents 90 kilometers away. Trying not to think about what would become of our passports and our only proof of American citizenship, we fully enjoyed the isolated town of Gyangze (13,000’), along with its fantastic 14th-century Palkhor monastery. Like a scene out of some exotic movie, the town was both remote and romantic, marked by an ancient fortress that crowned a cliff top at the town’s center. As our 19-year-old guide led us through the monastery’s dark sanctuary, lit solely by yak butter candles, a heavy aroma of incense filled a breathtaking chamber inhabited by a number of brilliant gold and jeweled Buddhas. The red-robed monks within chanted in the most beautiful manner, deep and pensive, soothing and clearing my mind with the omnipresent spiritual vibe that Tibet is world-famous for. As for my mother, the passports took priority. Nevertheless, we continued on up to the great Tashilhunpo monastery, the true iconic image of a Shangri-La temple cradled by jagged cliffs, where we stood in the presence of a gold and bejeweled bronze Buddha 88 feet in height, clearly dubbed the largest bronze statue in the world. Such a spectacle confirmed to me that everything here in Tibet must be measured on a colossal scale. And that scale became even more massive as we made our way south toward the Himalayas. Apart from an incident where our driver nearly got us into a fatal head-on collision after falling asleep at the wheel (my father had to react in a split second to evade a fully-loaded semi), the journey to Everest was both pleasant and awe-inspiring. Up through rocky mountain passes, down through cavernous gorges, through dry heat and wet cold, we passed village after village, all at around 16,000 feet in altitude. However, with such extremes came the unavoidable (and potentially fatal) nuisance that was AMS, or altitude sickness. My mother dealt with excruciating migraines and nausea, all while trying to fight a severe head cold and swollen glands. My father faced constant nosebleeds and numbness throughout the body. Apart from breathing problems at night, rather reminiscent of an asthma attack, I was relatively fine. We spent the night in Shegar, a freezing and desolate village that we later learned becomes overrun by hundreds of vicious, wild dogs at night. But while our nights tested our endurance and patience, it was the beauty of the journey and the people during the day that made it all worthwhile. We were lucky to witness a rare and fascinating event of true Tibetan culture: a circle dance performed by villagers on the side of the trail. Invited to drink barley beer with the elders, we were fully entertained by a swarm of children, some of them eager to see westerners for the very first time. Smiling and cordial, decked in elaborate woolen robes, necklaces of turquoise and coral beads, and gaudy silver ornaments, the Tibetan people will not be forgotten. Finally, after four straight days of off-road terrain, interactions with nomads, and plenty of police checkpoints, we arrived at Mt. Everest Base Camp 1 at a staggering altitude of more than 17,000 feet. We stayed at the tiny “village” of tents with two Tibetan kids, who demonstrated the most gracious hospitality, making us feel completely at home despite the unforgiving environment that engulfed us. All the while being mothered by a girl younger than I, we could not help but feel the looming presence of the “Universal Mother,” what the Tibetans call the highest mountain in the world. Everest was simply mind-blowing. At 29,029 feet, its sheer white and blinding face burst from the rock-strewn floor as the most intimidating work of nature I’ve ever come across in all my years of travel. “Impressive” hardly credits it enough. We were even lucky to have been present at the same time that an Australian expedition was planning to summit the mountain. Despite formidable gusts of wind and temperamental cloud cover, our image of Everest could not have been more perfect as we received an exceptional, unobstructed view. Entirely overcome with spirituality, I was successful in my attempt to keep with Tibetan Buddhist tradition by tying down my personal prayer flags at the base of the mountain. Inscribed with the signatures, wishes and prayers of my family and friends, even including a number of Liberty High’s faculty members, I could not help but feel an amazing sense of satisfaction. Representing Brentwood, Liberty High, and UC Berkeley, this expedition provided by far the greatest feeling of achievement since my graduation. Tibet has surely left its mark on me. It is a mysterious and magical place that unfortunately is rapidly disappearing due to increased Chinese efforts to assimilate it. People have often asked me why I choose such destinations to spend entire months in. My first response is this: having a passion for anthropology, I feel that it is necessary to experience and document the culture and environment of nations like Tibet before they are wiped out forever. Secondly, well, the trip was just way too cool to pass up!